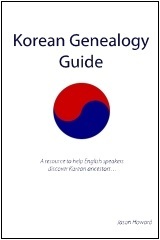 Three copies of the printed version of the Korean Genealogy Guide book were donated to the Family History Library in Salt Lake City. It is now listed in the Family History Library catalog at https://familysearch.org/search/catalog/2064272. The books appear to be loaned out frequently, which is a great sign of the growing interest in Korean genealogy. The book is also available for free in electronic form (pdf or html) on this site. The printed version is available at amazon.com and other bookstores.